Iran's parliamentary speaker has cancelled a visit to Canada after Ottawa announced it would shut its embassy in Tehran and expel Iranian diplomats from Canada. Ali Larijani decided not to attend a meeting of legislators from different countries scheduled for late October, the Fars news agency reported. In another development, Iran's Foreign Ministry said Ottawa's five-day deadline for its diplomats to leave was "unwise." It said Canada cut relations in an "unprofessional, unconventional and unjustifiable manner while resorting to misusing international law." 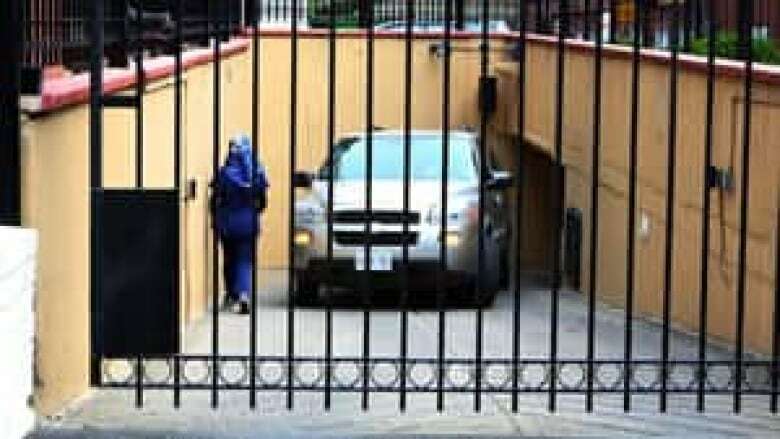 Foreign Affairs Minister John Baird insisted Friday that concerns about the safety of Canadian Embassy staff led to the closure of the country’s mission and the suspension of diplomatic relations with Iran. Ramin Mehmanparast, Iran's Foreign Ministry spokesperson, described the move as "hostile behaviour [by] the current racist government in Canada" that was influenced by the British and Israeli governments. Five Canadian diplomats quietly left Tehran early Friday morning — a decision that was based on "concern was for the safety of the men and women working at the Canadian mission," Baird said in an interview that aired Saturday on CBC Radio’s The House. "The mission in Tehran is not one of the safest we have," he said. "It faces a busy road and it could be overrun pretty quickly." Do you agree with Baird's move? Take our survey. Canada has not had a full ambassador in Iran since 2007, leaving a handful of staff members to run the mission. Relations between the two countries, already frosty, worsened after Iranian-Canadian photographer Zahra Kazemi was tortured and killed in Iran in 2003. In the CBC interview, Baird reiterated his previous statements about the more heavily fortified British Embassy, which was invaded and ransacked by Iranian student protesters last November. The British government accused Iran’s authorities of not providing proper security. Later on Friday, Baird formally listed Iran as a state sponsor of terrorism under the Justice for Victims of Terrorism Act. That will theoretically allow Canadians affected by terrorism supported by the Iranian regime to sue. 1980: Canadian Embassy closed for eight years after Canadians spirit U.S. diplomats out of Tehran during the post-revolution hostage crisis. 1996: Two countries cap a gradual return to normal diplomatic relations with an exchange of ambassadors. 2003: Relationship chills after Zahra Kazemi, a freelance photographer with dual Canadian-Iranian citizenship, is killed in custody in Iran, in what Canada describes as a state-sanctioned murder. Canada recalls its ambassador. 2012: After months of increasingly tough talk from Ottawa, Canada suspends all relations, citing several factors including treatment of foreign diplomats, Iran's support for Syria and its threats against Israel. Asked about reports that staff were cleared out of Iran due to an impending strike on Iran’s nuclear facilities by Israeli and U.S. forces, Baird would only say he knew of "no actions to be taken by another state." Canada is a strong supporter of Israel and a fierce critic of Iran, which raises the prospect the embassy could be targeted by reprisals in the event of any actions taken against Iran. Nader Hashemi, a Canadian political scientist who is director of the Centre of Middle East Studies at the University of Denver, said Ottawa's actions could be traced to an event held in Iran a week ago: a meeting of non-aligned states. "There was a lot of political lobbying by Israel and the U.S. for many of the countries not to attend, but just about all of them did," Hashemi said in a Saturday interview on CBC News Network. "I suspect someone from the government of Israel called the Harper government to say 'Look, we need some backup here.'" Hashemi said he believes the action would hurt Iranian-Canadians who are left without consular services. "Baird told Iranian-Canadians not to bother travelling to Iran," Hashemi said. "That's easy for him to say, he doesn't have family there." Hashemi said if Canada was so concerned about the conduct of the Iranian regime, it would have issued a stronger statement about the lack of human rights in the country, and called attention to two Canadians of Iranian origin currently being held in Tehran's notorious Evin prison — where Kazemi was killed in 2003. Baird reiterated in his CBC interview that Iran was a "state sponsor of terrorism" around the world and its government had demonstrated a "blatant disregard for the UN Security convention" in the past. "This regime is the biggest threat to peace and security in the world today," Baird said by phone from the Asia-Pacific summit in Vladivostok, Russia. The minister also cited Iran’s support for Syrian President Bashar al-Assad's regime, by reportedly supplying them with weapons to help fight a civil war that has claimed the lives of nearly 20,000 people to date, according to the United Nations. But when pressed on Russia’s position – which has refused to support any UN resolution calling for military sanctions in Syria – Baird was less critical. "We enjoy a long and cordial relationship with Russia," said Baird, adding that he had spoken with Russian officials about Canada's stance on the Syrian civil war. The Department of Foreign Affairs is asking Canadians in need of assistance in Iran to contact the Canadian Embassy in Ankara, Turkey. Anyone who needs urgent assistance should call the department's emergency line at 613-996-8885 or send an email to sos@international.gc.ca. Was it a good move to cut ties with Iran?